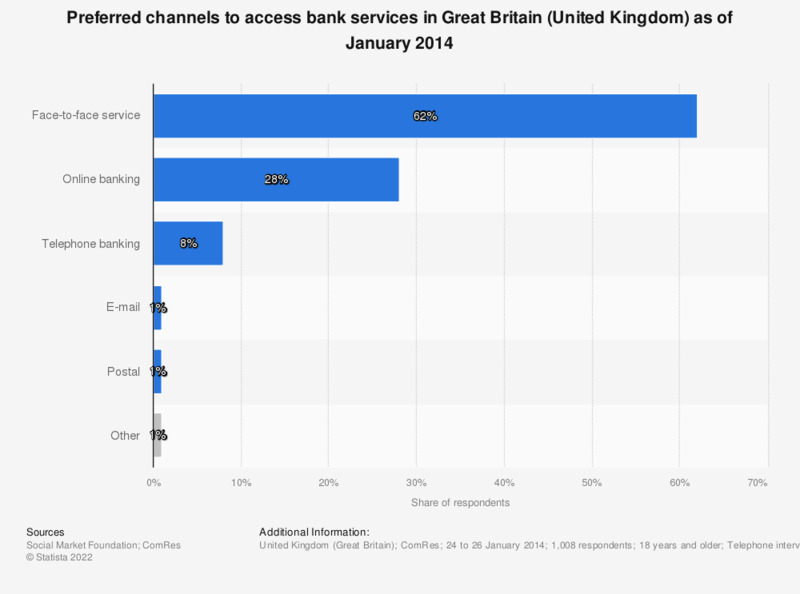 This statistic shows the banking channels preferred by British adults for accessing services in Great Britain (United Kingdom, UK) as of January 2014. The majority of respondents (62 percent) prefer face-to-face contact in a branch when accessing the banking services or information. The source adds the following information: "The data is weighted to be representative of British adults aged over 18." Everything On "Banking channels in the United Kingdom (UK)" in One Document: Edited and Divided into Handy Chapters. Including Detailed References. Statistics on "Banking channels in the United Kingdom (UK)"
United Kingdom: Which of the following methods do you use to communicate or interact with Lloyds Bank plc? United Kingdom: Which of the following methods do you use to communicate or interact with TSB Bank plc? United Kingdom: Which of the following methods do you use to communicate or interact with Barclays plc? United Kingdom: Which of the following methods do you use to communicate or interact with Santander UK plc? United Kingdom: Which of the following methods do you use to communicate or interact with the Nationwide Building Society? United Kingdom: Which, if any, of the products listed do you have from Yorkshire Bank?